Elastos is a blockchain based operating system which is the world’s first open source Internet Operating System. The Elastos Foundation was founded by Rong Chen and Sunny Feng Han, aiming to create a new Internet system powered by blockchain technology. On this new Internet, people will be able to own digital assets and generate wealth from them. Elastos will be used as the base-layer infrastructure rather than an application and has received sponsorship of over 200 million RMB from the Foxconn Group and other industry giants for its research and development. Elastos has open-sourced tens of millions of lines of source code, including more than four million lines of original source code. DApps are forced to never connect directly with the internet and only interact with the Elastos runtime (which in turn acts as a middle layer, then connecting to the internet) and you’ve essentially got a system that’s 90% more secure than the way IoT or smart devices currently work. Today if I have 50 smart devices in my home, they all interact with the internet, I need to worry about 50 security threats. With Elastos, all I need to worry about is 1 threat, an attack on the Elastos runtime itself, this is a 10x better set-up and applies to IoT or frankly any device, with the beauty being its code written in C++ so any device can run it, even your fridge, and it’s open source, so any developer can make whatever DApps they want. There are three major value propositions to Elastos. First is consumer/enterprise IoT as the key Elastos feature is security. In essence, this is targeting the onboarding of infrastructure/industrial software. ‘DApps’ here would really be non-interactive secure software behind smart devices, not something you and I would really interact with on a tablet for example but necessary to be secure if you want sustainable IoT per above. Second is consumer DApps, i.e. B2C. This really takes advantage of the P2P network aspect of Elastos OS and user IDs on the blockchain, with the security being an added plus but not the prime driver per say. These DApps will have their own side chains/tokens for whatever utility they serve. Elastos has a number of DApps already building on the platform – Zapya is a good example on the consumer end for P2P file sharing with 500 million users. Elastos often talks about facilitating a real digital asset economy where ‘scarcity’ and thus re-sale/trading of digital assets is possible (today if you buy a movie on the internet you can’t resell it like you can in the real world, which Elastos thinks should be fixed). Again, a big market with essentially the whole eCommerce market as a target market, underpinned by the security of Elastos. Third is enterprise DApps, i.e.B2B. Again this makes use of the P2P network, a good example here is ULink (China rentals) or the seed company Elastos has building DApps on it. Here the emphasis really is ability to track supply chain or information across the value chain and uses sidechains again. This market is large but this is where competitive advantage is weakest for Elastos as could use any blockchain for this purpose. Bitcoin = Trustworthy Ledger: Bitcoin introduced the power of decentralised ledger technology to the world, showing how we don’t need financial institutions to transact value. Bitcoin’s purpose is a digital currency, with the intent to become electronic cash. Bitcoin is great; however, it is extremely outdated. Bitcoin has very slow transaction times, expensive transaction fees and uses Proof of Work mining which is vastly uneconomical. Thanks to Bitcoin, the 2nd generation cryptocurrencies were born. Ethereum = Trustworthy Ledger + Smart Contracts: Ethereum, as well as many others, are second generation cryptocurrencies. Ethereum was one of the first cryptocurrencies to introduce ‘smart contracts’ and the concept of decentralised apps. Smart contracts put the trust of contracts in the trust of code. For example, If I bought a TV from an online merchant, the payment would only clear once the TV had arrived and I was satisfied with it. They can be coded to included things like ’14-day money back guarantee’ and every other element that is in a normal contract. Drastically improving efficiency and breeds a new generation of trust. Ethereum is a great project, however the scalability of smart contracts that are hosted on the Ethereum network is limited. A game called ‘CryptoKitties’ caused massive network congestion and that is just one of many decentralised applications that use smart contracts. Bugs within the Smart Contracts (security vulnerability). The issue with second generation smart contracts is that they have to run solely on the blockchain, which causes network congestion and high transaction costs. Decentralized applications for Elastos are run by blockchain technology but can be built on current Operating Systems (IOS, Andriod and computer). Rong Chen understands the importance of ease of use for both the consumer and the producers. The integration of multiple well known coding languages make development relativity easier than other blockchains. They also support Android and Apple Operating Systems, which most other blockchains do not. Elastos is not just the new internet, but the entire smart economy. Focusing on digital assets, monetizing computing power and spare storage, financially incentive trade of digital assets all combined with the highest level of security and the removal of the middleman. With speed, security and minimal cost at the heart of Elastos, it is bound to scale over time. Elastos is a third generation blockchain technology that tackles the issues we have with second generation cryptocurrencies such as Ethereum. In 2000, Rong Chen, a senior alumnus of Tsinghua University’s Computer Science department, returns to China from Microsoft USA and begins research and development for the first-generation Elastos network Operating System. In 2003, Rong Chen was received by Jin-Tao Hu, the former CPC General Secretary. In 2013, Foxconn makes investments in the Elastos Operating System open-source software project. In 2017, Sunny Feng Han and Ji-Han Wu started running the Bitcoin Investment Elastos Blockchain Community and founded G3 with Bitmain and NEO. In 2017, the Elastos Blockchain community received a global digital token investment worth 600 million RMB. 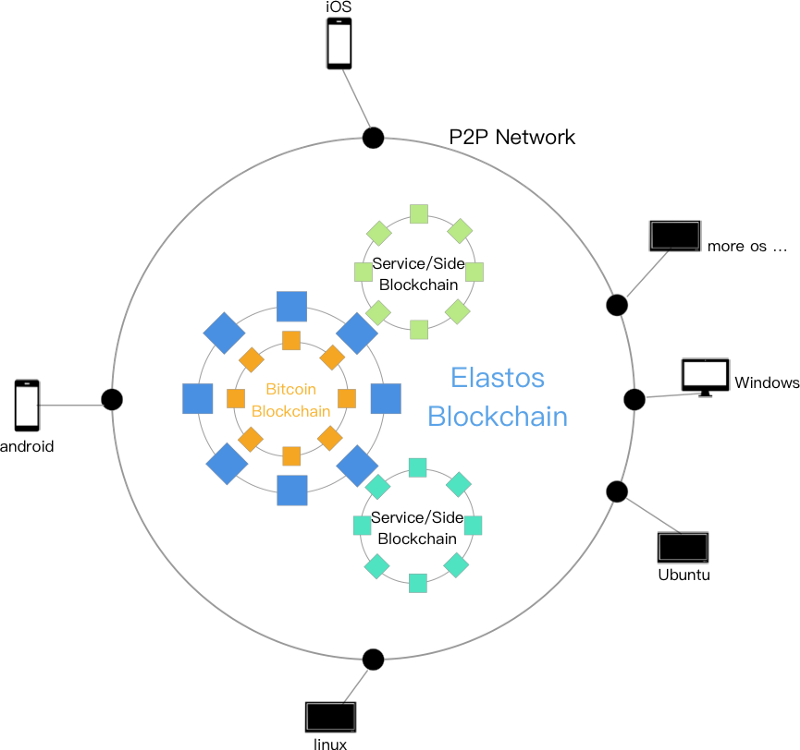 What is the Elastos Blockchain structure? Through the merged mining with Bitcoin, the safety and reliability are ensured by strong Bitcoin computing power through Proof of Work. This mining strategy saves resources and avoids repeated consumption. Because Elastos structure is built by having a main chain and side chain, it avoids main chain being overloaded, and leads to easy routing and flexible extension, increasing the possibility for the Elastos to become basis for future internet applications. The blockchain is a trust zone and a reliable internet database. Smart contracts are merely the saving process of this reliable database. Only the valuable data that needs to be notarized is recorded on the blockchain; only the data processing that needs computation reliability requires smart contracts. What are Elastos mainchain and sidechains in elastos ecosystem? One of the highlights of the design is that it makes use of a blend of mainchains and sidechains to improve the computational ability of blockchain technology. The mainchain only executes simple transactions and payment transfers while the sidechain handles smart contracts to support services and applications. With this structure scalability and security can be accomplished. Similar to the Operating System on a mobile device, users need a trustworthy location to store important data. 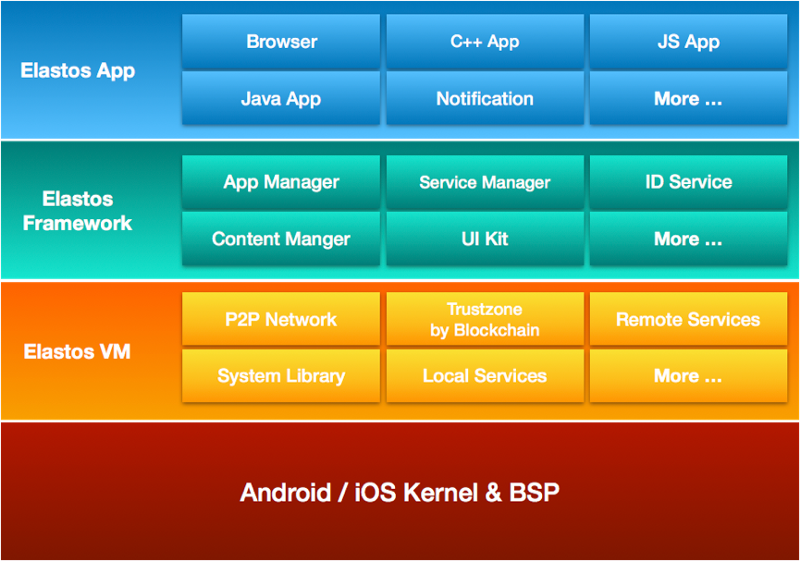 The Elastos blockchain works as this trust zone for the entire network Operating System. The Elastos blockchain applies main and sidechain solutions to facilitate the smart economy and a healthy decentralized application environment. This means that every application can create individual sidechains. The Elastos blockchain provides built-in, complete, easy-to-use sidechain support. They will also be customizable, allowing clients to pick a different consensus method depending on the use case. Any system built with blockchain technology has less computing power than a traditional computer, and so will not be able to meet the various requirements of internet applications (such as video games or streaming a high-definition movie). This is a fundamental reason why blockchains still cannot be applied on the internet at a large scale. The Elastos team recognizes this fact, and therefore believes that blockchain development should not rely solely on the main chain for computation. Elastos aims to scale their blockchain system by providing support for sidechains, which will help meet requirements for running applications with high IOPS. The Elastos main chain will be responsible for the small but very important role of trading and transferring ELA, thus providing stability to the blockchain system. Elastos wants to avoid bloating the main chain with unnecessary smart contracts. Instead, only major infrastructure upgrades will take place on the main chain. All other smart contracts can be implemented on sidechains, enabling scalability. This kind of hierarchical and structured design philosophy will pave the way for a future blockchain paradigm, such as the aforementioned development from stand-alone computation to a distributed one. This is a key innovation in blockchain technology, and more important than the partial technology of singular consensus algorithms and chains. The team will implement basic services as sidechains for global and public use. These services include ID generation, token distribution, digital asset trading, and fast payment systems. These basic services, all important infrastructural components, are part of the Elastos Smart Web. In addition, the team will also provide support for third-party sidechain development. Transactions are the most important part of the interface between the main and sidechains. The transaction procedure for sending tokens from the main chain to a sidechain is equivalent to sending from a user account on the main chain to a multi-signature address corresponding to the sidechain. The process automatically checks that the sidechain can identify the transaction and deposit the equivalent value of sidechain tokens to the sidechain account. What is the business model for Elastos? Usage of tokens can consume/use digital content in Elastos Runtime. Example of how the above works? Current blockchain technology allows for the recording of property rights. But while users can prove that digital books belong to them, they can’t necessarily prevent people from stealing or reading these books without permission. In such an environment, it is very difficult to monetize digital assets. Elastos aims to solve this problem by creating an environment in which the execution of a digital asset (i.e., the viewing, buying or selling of a digital movie) all take place on the Elastos Smart Web, and therefore abide by the rules of smart contracts. The creator of digital content can use a tool, provided by Elastos, to determine the number of digital assets to produce. Authors, for example, can decide that they only want to have 5000 copies of their books in circulation on the Smart Web. Setting a finite amount of digital content produces scarcity and enables the realization of capital. Elastos also wants to enable consumers to become investors. Say there are only 5000 digital books in circulation, and that these books become extremely popular. That means that every one of those books will increase in value, creating potential wealth for the people who bought them. After enjoying the book, the customer could sell it to someone else for a higher price. Users can also buy limited edition game apps. After playing those games in Elastos Runtime on their cell phones, they can sell the games to other people. Because these games are limited editions, their value will fluctuate on the second-hand market. In another use case, filmmakers could raise money for their movies by crowdfunding through issuing their tokens. The filmmakers could write a smart contract saying that every time someone watches the movie, token holders will get a small share of the fee. The filmmakers may also write another smart contract to let moviegoers sell the movie peer-to-peer or via social networks and receive commissions. This system creates financial opportunities for both creators and consumers, thus incentivizing more people to use Elastos. The accumulation of more users will incentivize more digital content creators to produce and publish content on the Elastos platform. This increase in content could then attract even more users, and those additional users will create more content. This is a positive cycle that will result in a large amount of valuable digital content that can be used to generate wealth. Ethereum has one single mainchain structure which leads to the upper limit of computing power and extensibility. Data transaction speed is limited by the individual node in the chain, though there are thousands of computation nodes. It is practically impossible to satisfy various needs in the future by only one chain. Elastos proposes to adopt a flexible main chain and sidechain blockchain design structure. The main chain is only responsible for basic transactions and payments while the sidechain executes smart contracts to support various applications and services. Ethereum has data redundancy and network congestion. The setting that smart contracts are exposed to DApps and all the data and code are placed on the mainchain leads to data redundancy in main storage. Now the scale of Ethereum data exceeds that of Bitcoin, while network congestions have occurred. Elastos runs applications on Elastos runtime as opposed to the already congested blockchain. This method is more secure. All network data must be sent through a trustable and verifiable channel. Identification and authentication come from the blockchain ID. This way, the blockchain’s credibility can be transferred to Elastos Runtime. 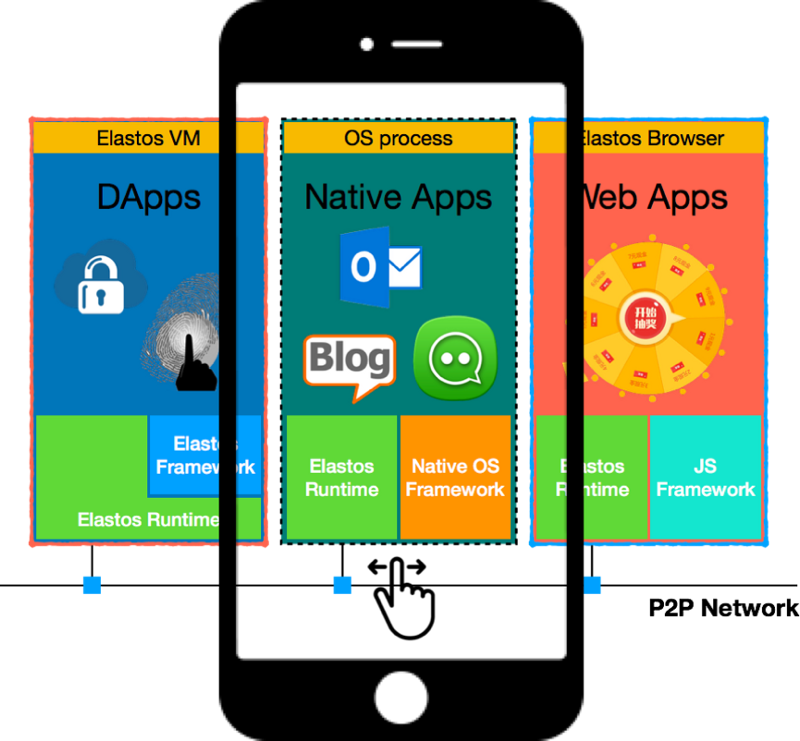 Elastos Runtime can have various forms like an independent OS, a virtual machine, or a software development kit(SDK) that integrates into native apps of other mainstream Operating Systems. Ethereum has data exposure risk. After obtaining data, DApps are run at the user frontend, causing possible data exposure. Elastos has safety is at the core, decentralized applications are forbidden from accessing the network so they are not subject to DDoS attacks. There is also no need for IP addresses so users are far less likely to get hacked. EOS is a blockchain Operating System, but its development period and open source codes are much shorter than Elastos’ 18 plus years. Elastos has released more than 4 million lines of code to github and plans to release 10+ million lines of code in total(contributing to the open source community). EOS is dependent on its main-chain, so no matter how optimized it becomes, its throughput is limited. Elastos can extend the throughput infinitely with flexible main-chain and side-chain solution. Also, Elastos Runtime can deliver the trust function of the blockchain to a user’s application(like a cell phone, laptop, etc) which applies the blockchain to various scenarios in daily life. EOS, through the adoption of the delegated proof of stake(DPoS)consensus mechanism, can realize high throughput rate. Elastos computation bandwidth is distributed according to the number of tokens held. It refers to the design philosophy of time sliced distribution in the traditional multi-task Operating System and encourages the community to hold tokens. The main-chain design focuses on improving extensibility for smooth access to sidechain. The consensus mechanism on the sidechain can be anything(from DPoS to DBFT to anything else). EOS runs everything utilizing main chain for everything. Elastos services on the Elastos blockchain layer can be shared by multiple side chains. This greately lowers the mainchain pressure. When necessary, the sidechain can be duplicated to extend sidechain-level service capability through bifurcation mechanism, while the extension of this computing power can be infinite. Blockstack combines encrypted, distributed storage and blockchain ID to make sure all the data belongs to the owner. Elastos applies a similar method for digital assets storage where users could apply for an ID for their digital assets on the blockchain, which guarantees the ownership of those digital contents but a key differentiation with blockstack is that the ownership of these digital contents will also be transferable and tradable, thereby making these digital assets consumable and investable and of high value, thereby contributing to a smart economy of trading digital goods. Even though the digital assets are decrypted, they cannot escape elastos runtime operating environment which guarantees that it will never disclose or damage the ownership of the digital contents. Decentralized and Encrypted: ID Authentication step is required before information is transferred, which prevents DDoS attack from happening. Peer-to-peer (P2P) secures the communication: no central server, no content leaking or man-in-the-middle (MITM) attack. Efficient data transfer between distributed nodes, such as video and audio streaming or text messaging. In the centralized world there is a variety of communication tools including Gmail, WeChat ID, Alipay, WhatsApp etc. We are connected with each other using these tools associated with our IDs. There is an emerging trend and security necessity for people to have a totally decentralized ID system to identify each other, without 3rd party control — this is DID. Everyone needs a traceable ID for historical records. DID is built on the blockchain and provides a reliable ID to everyone and “everything”. The ID can be used for backtracing, authentication, and building trusted connections. By combining P2P and DID, Carrier leverages trusted ID to make communication more reliable, trustworthy and secure. Elastos VM: The VM runs on a host OS and has better integration with current mainstream OS such as Android and iOS. It ensures formation of a closed runtime environment enabling the separation from the host OS, ensuring safety of data and code. The ‘Remote Service Interface’ replaces the traditional TCP/IP programming model, providing safe and reliable network transactions. This means no more IP addresses and a discovery mechanism will be used instead to access dapps and websites on the elastos internet(where each item has its own UUID – Universal Unique Identifier). Elastos Runtime: A software library that contains some of Elastos functionality. It provides the target OS applications with the needed Elastos functions, similar to the Alipay SDK serving other applications and making them capable of having payment functions. Elastos runtime can use trusted network communications and conduct safe and reliable data exchange and allows information exchange with the blockchain, confirming digital asset ownership and identity. Elastos Browser: A specialized browser where the Elastos runtime is embedded. In this browser, web applications can run with partial Elastos functions. Using Elastos browser bridges the gap to provide JS programming support for developing various applications. JS applications can use trusted network communications and conduct safe and reliable data exchange and also conduct information exchange with the main chain, confirming digital asset ownership and identity. 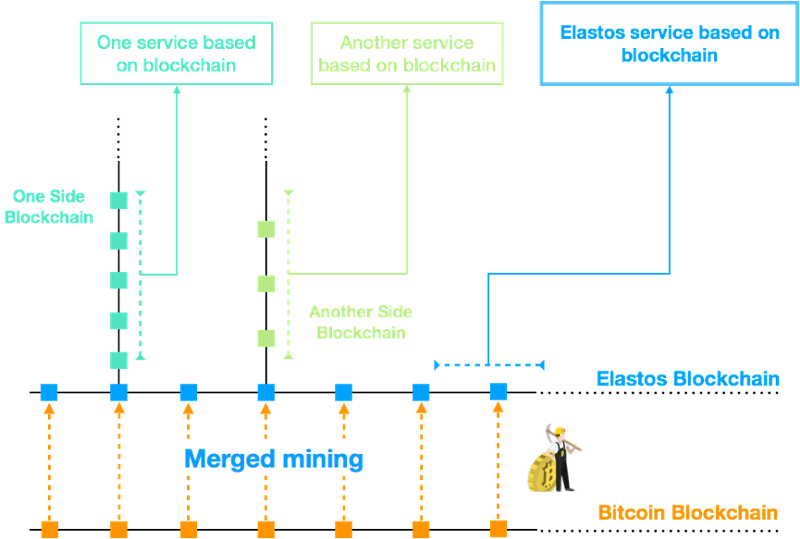 The Elastos blockchain utilizes merged mining with Bitcoin, the process by which consensus is reached on both chains simultaneously. In this case, the Bitcoin blockchain works as the parent blockchain to Elastos, with the Elastos chain as its auxiliary blockchain. The mining pools will deploy merged mining code and miners will submit proof of work to both blockchains at the same time. Energy consumption does not increase with merged mining, and will be equal to the energy consumed for mining either alone. Through this mechanism, the Elastos blockchain has an extremely strong guarantee of computing power and will then be able to provide blockchain innovations at a global scale. It makes full use of existing Bitcoin computing resources in addition to being environmentally friendly. Elastos implements merged mining with Bitcoin. The strategy of merged mining saves resources and avoids repeated consumption. Miner submits Proof of Work(PoW) to both Bitcoin and Elastos and enjoys profits of mining competition without extra consumption of computing power. The consensus mechanism for Elastos is AuxPoW+DPoS where the mining reward distribution is 35% for AuxPoW, 35% for DPoS, 20% for Ecosystem Application Reward and 10% for Foundation Running and Development. Tokens for apps built on Elastos can be published on sidechains. These tokens may participate in two-way asset transfer across the main chain and side chains. The transfer of trust over multiple chains. The Elastos main chain is merged mined along with the Bitcoin main chain. This merged mining characteristic can be extended to Elastos sidechains as long as the sidechain adopts the same Proof of Work consensus. Thus, layers of chains can be merged mined recursively, which establishes a hierarchy of trust among chains. Isolated nodes. An auxiliary blockchain, or sidechain, dependent on merged mining does not need a consensus of multiple nodes. In the extreme case, one chain only needs one node and does not diminish the reliability of the ledger information on the main chain or other chains. No other blockchain consensus algorithm has this kind of advantage. Utilities of ELA(currency for Elastos)? The Elastos blockchain really only serves one function, being the ID system needed to connect into the Elastos intranet. The blockchain doesn’t need to scale as it’s just storing simple IDs. This is important as unlike other platform blockchains like ETH etc which are trying to push millions of transactions through the blockchain (thus resulting in ballooning ledgers and scaling issues), here transactions go through the decentralised secure P2P network not the blockchain, so no scaling issues. Incentive for DApps to use Elastos does not come from an incentive to use the Elastos blockchain itself, this isn’t Ethereum. DApps are incentivised to use the Elastos operating system/P2P infrastructure and using its blockchain for decentralised IDs is a requirement to use that. Elastos ecosystem collaboration projects(dapps built on Elastos in collaboration with Elastos) have to lock no less than 2-5% of their project tokens published for converting into ELA. 20% of the project tokens(converted to ELA) will be used for Elastos foundation development. 80% of the actual project tokens will be rewards shared by all ELA holders. Eg. If a dapp decides to create 10 billion of tokenX, at least 200 million will be distributed. Out of these 200 million, 40 million will be converted to ELA and given to the Elastos foundation. The rest 160 million will be distributed to all ELA holders. So, if you are holding 300 ELA and the supply of all ela holders adds up to 10 million(locked and unlocked ela both), you’ll get approximately 4800 of tokenX airdropped to you for free. Users can use ELA to register an ID in Elastos and use this ID to purchase items such as DApps, cloud storage and many other resources, including other digital products and so on. Those who decide to lock their ELA(minimum of 300) will earn an interest of 4%, 5%, 6% for up to 3 years(not compounded year-to-year). ELA will be the main currency that will be used to reward developers for creating dapps on the Elastos platform. Users can participate in token sale projects and products with ELA within Elastos. Apps built on elastos can implement their system to process transactions using ela/sela. How is NEO related to Elastos? – First of all, a common misconception is that Elastos is built on NEO platform. This is completely false. Elastos has its own blockchain and is NOT a NEP5 token. Elastos already has its main network that went live back in December 2017 at https://blockchain.elastos.org/. Da Hongfei of NEO and Jihan Wu of Bitmain are both early investors and advisors to Elastos. Jihan Wu has committed to redirecting hashing power from Bitcoin mining to Elastos. G3 is a co-operation between NEO, Elastos and Bitmain who share a vision of a decentralized economy and smart web. Key features of the smart web include the virtual machine, runtime environments and trust zone, provided by Elastos and Bitmain, consensus provided by NEO and KYC provided by Ontology. G3 is meant to cooperate with Chinese government regulations and considering two of the leading figures of Chinese blockchain are involved (Jihan Wu and Da Hongfei), the likelihood that these projects will greatly succeed when the Chinese adopt crypto-friendly regulations is very, very high. Foxconn group: World’s largest electronics manufacturer – Elastos received a $31 million sponsorship from Foxconn group for R&D: Foxconn Technology Group, is a multinational electronics contract manufacturing company headquartered in Tucheng, New Taipei, Taiwan. Foxconn is the world’s largest contract electronics manufacturer . Sponsored Elastos of over 200 million RMB from the Foxconn Group for its Research and Development. SAIC Motor (China’s largest auto manufacturer) – A Chinese Leading automaker has signed development collaboration agreement of smart driving with Elastos (SAIC Motor is Tesla’s state-owned automobile manufacturing partner in China). The Beijing-based car manufacturer aims to bring in cutting-edge technologies for its models through the partnership which covers vehicular central consoles, electric car control units, high-performance computers and mobile phones. Zapya(p2p file transferring, with 500million users): Zapya is a peer-to-peer file sharing app across different platforms such as Android and IOS phone, WP, PC etc. Zapya ranked #1 among the similar category Apps. This app enables users in countries even with low internet penetration and poor internet architecture to transfer and share files without using the internet, by creating a Wi-Fi hotspot to which other devices can connect. Zapya agrees to build on top of Elastos with a decentralized app called ViewChain. Alibaba’s Security Department: China’s largest electronic commerce company, and the Central Research Institute of Huawei, the globally largest ICCT enterprise, have communicated and cooperated with the Elastos team for many times. Aviation Industry Corporation of China(AVIC): (AVIC) a Chinese state owned aerospace/defense company and also ranked 159th place in the Fortune 500 company. AVIC is extremely interested in creating DApps in the Elastos network. Tencent: Tencent is a Chinese multinational investment holding conglomerate whose subsidiaries specialize in various Internet related services and products, entertainment, AI and technology both in China and globally. Sunny Feng Han, co founder of Elastos and a visiting scholar at Columbia University, has deep connections with Tencent. Author of Blockchain: Quantum Wealth that was recommended by Tencent, and has regularly met with Tencent trustees and angel investors to discuss cooperation with Elastos. Tsinghua University and Shanghai Jiao Tong University: Elastos openly chooses talents from China’s best universities such as Tsinghua University and Shanghai Jiao Tong University. Viewchain – Decentralized Content Distribution Platform: Viewchain utilizes Blockchain, IPFS and Zapya to exponentially increase content storage, copyright tracking, access to content, and incentives given. Viewchain is aimed to revolutionize the way we share content. Viewchain will give everyone the opportunity and freedom to create their own content and share it with others. The idea for this system originated from a new pattern of transferring that Zapya Users started to exhibit. Zapya now has over 500 million registered users and 76 million active users around the world. The Zapya app allows communities to make a local network and then subsequently transfer data – apps, videos, music – back and forth. In addition, Zapya’s “Phone Replicate” feature can easily backup and transfer files from an old mobile device to a new one. Zapya is very popular India, Southeast Asia, China, Pakistan , nd Cuba. In some areas, Zapya is even more famous than Facebook. Reactor: Reactor Independent Game Guild(RIGG) is a decentralized game distribution platform for PC and Mobile phone. Through becoming a strategic partner with Elastos, RIGG will be able to use blockchain and smart contracts to let players and game developers get involved in the game distribution process without the help of inter-mediator. Also, high quality, limited edition or high price equipment and asset in the games could be able to trade peer to peer among players. Right now influential live stream players are not rewarded as they should be. The influencers could be empowered through the use of smart contract so that they could get more benefit from the show. Trust Credit Power(TCP): Trust Credit Power is to build the consensus and trust for participants, and set up a credit system through the Blockchain technology and its application in order to empower people and business. China has multimillion rental population, rental property business is a multi-billion business. Information mismatch and the complication of transaction made trust system hard to build. TCP worked with over 300 rental property companies and has over 120,000 properties under management, with more and more people move into the city, rental business is growing very fast. Through the help of the Blockchain technology, TCP could verify the real identity of each party and smart contract could make the business transaction more secure and efficient. Also, TCP and Elastos is developing smart home equipment. Now with 40,000 smart router to begin with, they have P2P network roots down to the earth. Panda Green Energy Exchange (HK Public Company, United Nation Partner): Panda Green is a world leading ecosystem solution provider located in Hong Kong. Panda Green is one of the largest solar energy producer in China. Panda Green will use Elastos blockchain technology to set up the clean energy trading platform. Panda Green will not have ICO, rather, their token will be used to reward customer’s behavior. Consumption of clean energy or using an electrical car will be rewarded. You can use the reward token to pay for your electricity bills, pay for Uber or sharing bicycles. With the help of Elastos, Panda Green will have a great performance at energy sector. Origin Agritech Ltd(Nasdaq public company): Origin is a world leading seeds provider company and is the first commercial seed company in China. Origin sell hybrid seeds in more than 10,000 locations down to Chinese small villages and rural agriculture area. It provides bio-technology agriculture seeds product called hybrid seeds. Origin also help Chinese Ministry of Agriculture to track seed supply. This information is very strategic for the whole nation. If the starving problem does not handled well, country like China with such population will have big trouble. Also, the quality of the seed, logistic issues are really important information for the government. With the help of Blockchain technology, tracking could become much more cost-effective and reliable because of the data on the blockchain is non-changeable. Not just for seeds, blockchain could be used for agriculture fruits too. For example, how to make sure the food is safe or how to test whether it is organic food or not. A blockchain tracking system could fulfill this need. Origin already have 20 years business experience in China, it understand the needs of consumption. Also, Origin is getting involved in the agriculture product E-Commerce now. Two Chinese E-Commerce sites that are growing very fast now is called People Go and Yunji. They are building Social E-Commerce apps. Origin helps Yunji raised 40 billion RMB Fund. Also, China is prepared to liberate the privatize the farmlands now. With the help of blockchain technology, manage, monetize and transfer farmland could become more efficient and easier. Sure, but how can I get started? WARNING: You can only buy ELA from the sites listed above. Any other sites offering to buy/sell ELA are scams. Protect yourself. Please, DO NOT try to store ELA on MEW or NEON wallet or any other wallets out there because ELA has its own blockchain. It is neither an ERC20 token nor a NEP5 token.